Shannon A. Thompson’s novel Minutes Before Sunset was a Goodreads Book of the Month in July and tells the story of two young adults trying to balance their supernatural gifts with a desire to live in the human world. Every story has rules. In comic books, the superheroes have certain powers and not others. In horror stories, monsters can be killed only with silver bullets or certain chants. In romances, the heroine falls for certain kinds of men and not others. Pam Houston wrote a novel titled Cowboys are My Weakness. The rules of the novel are announced before you even open the book. Every story ever written or told must announce the rules it will play by. The trick, as a writer, is to show those rules without disrupting the narrative. 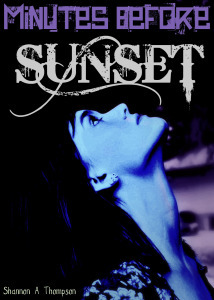 Shannon A. Thompson sets the rules clearly and quickly in her Young Adult/Paranormal novel Minutes Before Sunset. You can read the first chapter here. Once you’re aware of how stories set the rules that their characters must live by, you can’t avoid seeing it’s done. Whether the fiction is genre or literary, the need to impose boundaries and limitations on characters is the same. The world is imposing clear boundaries on the characters: literally, a blockade with cannon balls and bombs. At no point in the story will the characters be able to act as if these impediments do not exist. “I moved my foot closer to the edge of the hill. I wanted to ride the wind down to the crowd. I wanted to dance and smile. I wanted to throw my arms in the air and listen to the exploding fireworks. I wanted to run around in endless circles until I fell down from exhaustion. I wanted to enjoy everything. In these two passages, we learn the fundamentals of the story: the town has an Ignorance-is-bliss attitude. The narrator would like to join the smiling townspeople, but, for a reason that will be revealed later, he’s prevented from doing so. This mental and physical limitation defines his character and determines how the story will move forward. Now, free write about the character. How does he/she feel about the image you just created? Try to find an action that suggests the character’s attitude toward the world. For instance, in The Hunger Games, the fact that Katniss sneaks through the fence in order to hunt suggests that she’s willing to break the rules to protect her family. Thus, the big event at the end of the first chapter—volunteering for the Games in place of her sister—feels like a natural extension of her character, of the attitude that we’ve already witnessed. Thanks! And I’m serious, you’ll see this everywhere. I was at the gym, and the movie *Gone in 60 Seconds *was playing, and the rode the bike and watched Nicholas Cage set up the rules of the story. I love this. Thank you for including Minutes Before Sunset. I think your prompt is very clear, and I’m sharing this on my websites now. My pleasure, Shannon. Thanks for sharing. In this and the last exercise about character I have really noticed the importance of defining a character’s relationship with the world. This may have been obvious to others but it has opened up a whole new depth in my drafts and a shortcut to reaching the kind of feelings and emotions I used to spend pages trying to get right. Thanks! So glad you’re finding the exercises helpful. You’re right, when you define relationships, like between character and world, it suddenly makes you see things you didn’t see before. Strangely enough, this is something that some genre writers are good at–because they’re not worried about nuance. So it’s easy to see the strategies they use to get it done. Good luck with your writing!